Welcome to the ISG Hotel and Conference Venue in Heidelberg! 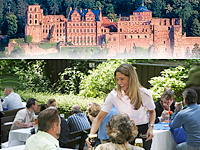 Take a break and explore Heidelberg with our weekend special for two. Many of the rooms at our Hotel in Heidelberg are furnished in the Bauhaus style and have a wonderful view over the Rhine valley.